Shoot Fruit is one of Ashley's microgames in WarioWare: D.I.Y. The point of the game is to shoot the moving piece of fruit with an arrow. The fruits vary from melons, grapes, and apples. The fruit moves around at the top of the screen from left to right. 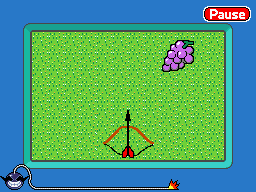 The player needs to tap the bow to release the arrow when the fruit is in the middle of the stage. If the player hits the fruit, the game is won. However, if the player misses the fruit or time runs out, the game ends in a loss. The game and even the description is based off of folk hero William Tell, who tried to shoot an apple with an arrow placed on his son's head. This page was last edited on July 19, 2018, at 10:09.